Check out one of these open houses this Sunday, Sept. 18th, 2016, 2pm-4pm. Devonshire Pointe Subdivision. Great floor plan. Hardwood floors through the foyer and dining room. Ceramic in kitchen, half bath and laundry. New kitchen counters. The kitchen is open to the family room. Delightful finished lower level. Perfect for teenagers. Very nice master suite with separate tub and shower. Open loft area at the top of the stairs overlooking the foyer on the second floor. The deck is large enough to host great parties. New Listing in The Reserve of Knollwood. This exquisite home is in the gated community of the Reserve. It is minutes from Notre Dame, South Bend, Granger, Lake Michigan and 90 miles from Chicago. Beautiful, well maintained landscaping offers a serene backyard. 2.7 acres of privacy. The floor plan is laid out perfectly for entertaining. This home offers everything you expect, a gourmet kitchen, wood floors, granite, custom cabinetry, Sub-Zero and Wolf stainless appliances, spacious windows, attention to detail and immaculate condition. 3 bedrooms, 2 full bath and 2 half baths, 4992 sq ft. Call to make your appointment!! Beautiful house!! Stunning custom built home by Village Contractors. Immaculate throughout with great attention to detail. The interior features extensive wood trim and detail work in every room, hardwood floors through the foyer, dining room, great room, study, kitchen and half bath, Custom windows fill one wall of the 2 story great room overlooking the backyard, Ayr Cabinetry throughout the home, the kitchen offers granite counters, stainless appliances, sub-zero refrigerator, Thermador cook-top, an open curved stairway leads to the lower level walkout featuring the 4th bedroom, bath with a sauna, a multi-purpose room and the family room with a wall of glass looking over the backyard. 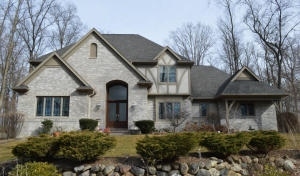 The wooded backyard buffers the home from the golf course and offers privacy. 4 Bedroom, 2.5 Bath $264,900. Check out the Featured Properties tab for more pictures of this listing. Offered by: Anita Hildebrecht, Broker with Remax 100. Check out the featured property tab for more picture and information. Check THIS out for our new listing! You got to see it!